As the mixer fiercely whipped the hot sugar syrup, a plume of mist roared out of the bowl. The transformation from clear and gooey to white and pillowy was simply incredible. It took 12 minutes. Nothing more, nothing less. Then there was sticky marshmallow everywhere. It stayed glued to the walls of the bowl after I poured it in a pan greased and dusted with confectioners’ sugar. It stubbornly clung onto the wire whip and the rubber spatula. It stuck to my fingers, too, which left me with no other choice but to lick them clean. The intoxicating scent of peppermint filled my kitchen and didn’t help one bit. It made me want to lick off the sticky strings of marshmallow all the more. My very first homemade marshmallow started out as a desperate tweet to find a store in the city that sells multicolored mini-marshmallows for my church window candies. All the stores I visited, six or seven in all, didn’t carry the elusive colored marshmallows I wanted and everyone kept raving about how easy it is to make them from scratch. Making marshmallows wasn’t only easy, it was loads of fun. I’m just not certain which I enjoyed more — making or eating them. Turn the mixer on low speed and, while running, slowly pour the sugar syrup down the side of the bowl into the gelatin mixture. Once you have added all of the syrup, increase the speed to high. Continue to whip until the mixture becomes very thick and is lukewarm, approximately 12 to 15 minutes. Add the peppermint extract during the last minute of whipping. While the mixture is whipping prepare the pans as follows. When ready, pour the mixture into the prepared pan, using a lightly oiled spatula for spreading evenly into the pan. 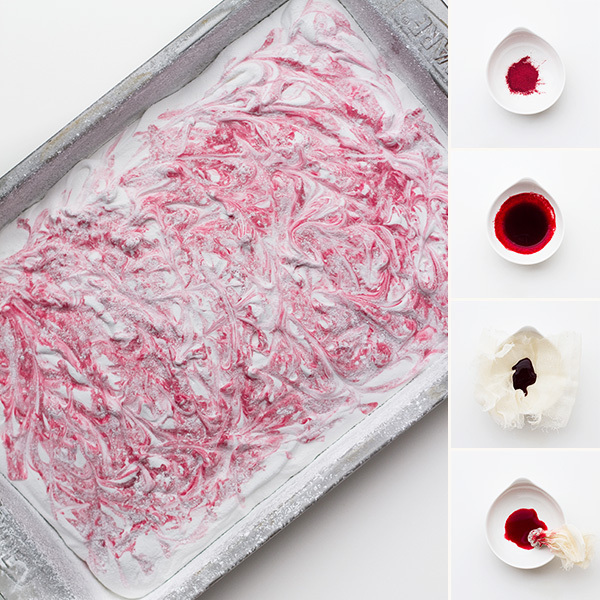 Dot the marshmallow across the pan with red food coloring made from red beet powder and using a fork or toothpick, swirl the food coloring to create a marbleized effect. Dust the top with enough of the remaining sugar and cornstarch mixture to lightly cover. Reserve the rest for later. Allow the marshmallows to sit uncovered for at least 4 hours and up to overnight. 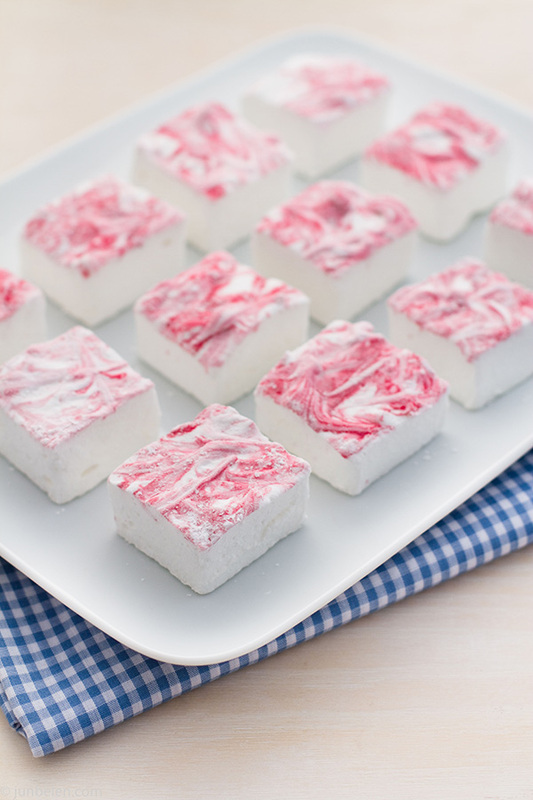 Turn the marshmallows out onto a cutting board and cut into 1-inch squares using a knife dusted with the confectioners’ sugar mixture. Once cut, lightly dust all sides of each marshmallow with the remaining mixture, using additional if necessary. Store in an airtight container for up to 3 weeks. 1. To make regular marshmallows, add vanilla extract instead of peppermint extract. 2. Red beet powder can be used to make a natural organic red food color. Click here to read more about red beet powder. 3. To make miniature marshmallows, combine the confectioners’ sugar and cornstarch in a small bowl. Line 4 half sheet pans with parchment paper, spray the paper with nonstick cooking spray and dust with the confectioners’ sugar mixture. Thanks, Tracy! I have to try Lil Puffs soon! They’re in San Jose, right? And of course, I love s’mores! My next experiment would have to be making graham crackers from scratch now that I have marshmallows nailed! so cool that u used beet powder for the colour!!! i’ve gotten into one too many mishaps trying to dye things naturally, so when u posted about natural food colouring, i was instantly attached. this post made me laugh on this sunny Wednesday afternoon thx. GAH! Get out of my brain! 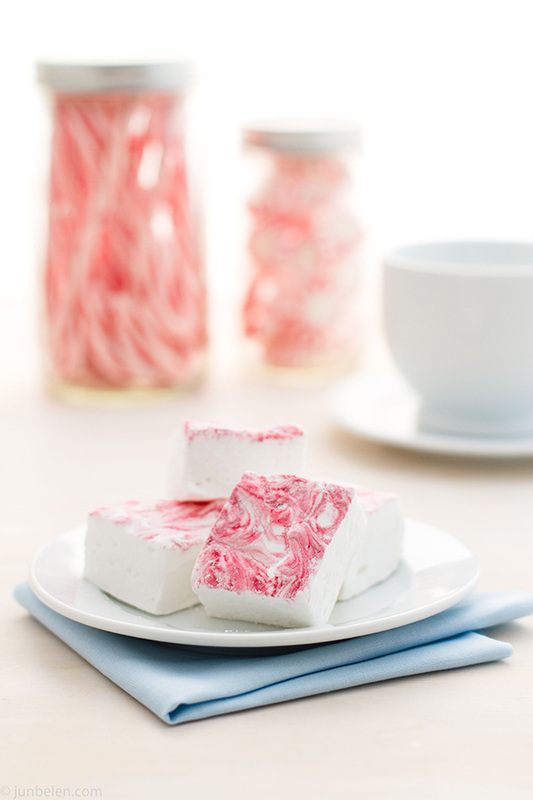 I’m making peppermint marshmallows for something this Sunday. I just need to run out and get some supplies. I hope they turn out as nice as yours! Thanks, Irvin! Looking forward to Sunday! Thanks, Lala. Making marshmallows weren’t all that bad. They were sticky but that’s part of the fun! Have you dropped one in a steamy mug of rich hot chocolate yet? OMG! they look so yummy. And it’s good to know that while I was cleaning up (and eating) the remains of my rugelach-baking bonanza this week, you were cleaning up sticky-gooey sweet stuff. Misery loves company. These look fabulous! Glad your painful search for colored marshmallows spurred you on to make these. Oh, wow! What gorgeous treats! I am such a lazy cook and way too scared to try this. Stanford is such a happy puppy. I love, love the twinkle in his eyes. Thanks for sharing this, Jun! Thank you, Annapet! We miss your tweets!! So happy to see that you used beet powder to color your marshmallows. I hate using artificial coloring in my baking. Now I have an alternative. Are there other natural colorings that you use? So pretty. I love the food coloring you made. I can imagine how messy this would be. Amaya would go crazy over the bowl of marshmallow stickyness. What a great idea. Neat pictures also. You should definitely share these over at http://www.dishfolio.com. You would be a great addition. Thank you, Dustin for stopping by and for the heads up about dishfolio.com! Beautiful photos!!! Love the colors.. the dark pink against the pure white is simply gorgeous!! Jun, these marshmallows are so pretty. I don’t know how else to describe them. I like the delicate layer of color, not too much, just right. And I bet the peppermint notes hits the spot, too. I know it would for me! Thank you, Jean. Merry Christmas to you and your family, too! Great job, Jun! How funny that we both did marshmallow experiments the same few days 😉 These are infinitely prettier than mine, though! Very lovely one, Jun! I like the fact that you use a natural colour from beets. I actually did a double take when I saw this!!! Maybe I’ll make some and have them ready for hot chocolate on Christmas day! I just made these (halved the recipe because I don’t need 60 marshmallows) and I over beat the mallow – only beat it for about 7 minutes but it was already too thick to pour and I ended up with a heck of a mess 😉 I managed to spread it somewhat but It’s definitely not as neat as yours. I hope they turn out. This recipe sounds very intriguing! Thank you! Hi, what brand of gelatin did you use? I tried this recipe using Alsa gelatin but it did not bloom so my marshmallow mixture was too thin. Thanks for sharing this recipe. I used Knox unflavored gelatin Good luck and let me know how it goes.